Few artificial lift companies can match the level of experience that Liberty Lift has in the industry. Our senior leadership brings more than a century’s worth to the job, so Liberty Lift can develop detailed, responsive solutions for any client’s operation. Liberty Lift’s advanced product lineup is designed to meet every challenge and is constantly undergoing improvement and updating. Our Yukon facility is a complement to our significant presence in Oklahoma and nearby producing areas. Our mission is to get the most out of every well, safely and efficiently. Liberty Lift isn’t merely an equipment dealer. We are a total artificial lift solution provider, with extensive design, manufacturing and support expertise. Liberty Lift, then, acts as a partner to its clients, responding to their changing artificial lift needs with industry-leading technology and skills. Our pumping units have earned the API monogram and soundly defeat API 11E specifications. Liberty Lift’s quality standards are also designed to exceed API standards, and because we are a dynamic, svelte operation, we can rapidly respond to any of our client’s needs. In the field or in facility, Liberty Lift is there. Oil & gas companies have radically enhanced their drilling and extraction capabilities in recent decades, accessing formations once thought impossible. As a result, artificial lift technology is needed more than ever to help transport that unlocked energy. Liberty Lift’s artificial lift solutions are built to do just that, with capabilities apparent throughout the well’s lift cycle. Every well is different, so every one of Liberty Lift’s solutions are custom-built and designed to defeat any challenge. Our array of products include the well-worn and proven beam pumping unit, the solid-defying power of gas lift systems and the extremely versatile and capable hydraulic jet pump. Liberty Lift has also developed and manufactured its XL Long Stroke unit, which leverages an impressive 306 or 366 inch stroke length to get more out of every cycle. Finally, Liberty Lift’s solutions are aimed at long-term reliability and durability, as our support technicians can produce and change out parts in rapid fashion, both in the field and in facility. We work tirelessly to create artificial lift options that far exceed efficiency, quality and safety standards. There is no well, no matter how challenging, that Liberty Lift can’t work with. Our advanced artificial lift solutions can stimulate deep and shallow wells, wells with low or high flow, and wells that are soaked with solids or extensively deviated. Liberty Lift has the intelligence and brawn to get the job done, with the industry’s best engineers and support technicians. Our team of experts brings more than a century of experience to every client, our iron exceeds API standards, and our design and maintenance people ensure maximum reliability, therefore productivity, out of every pump. There is no doubting Liberty Lift’s engineering and manufacturing capabilities, but what keeps all of our solutions glued together is our support personnel. Few technician teams can stand toe to toe with Liberty Lift’s, as our support experts can provide an incredible range of services for any project or lift operations. 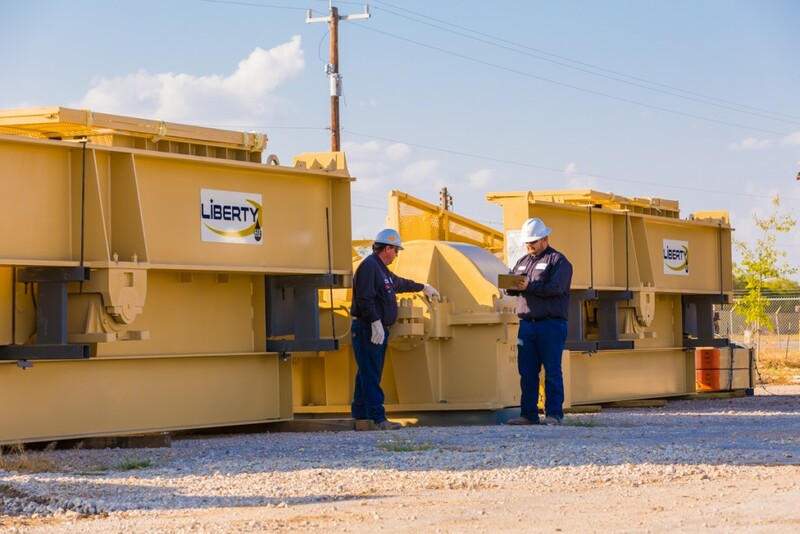 Liberty Lift operates several facilities in primary U.S. drilling regions, and each one can provide repair, testing, fabrication and machining services. If a client needs a part, our support people can modify an existing component or produce one from scratch, and then deliver it with minimal turnaround. Our support technicians are just as capable in the field and are available every day of the year, every hour of the day. At the well, Liberty Lift can perform full inspections of all pumping units, providing preventative maintenance where necessary to ensure continued production. We can replace rods, belts, sheaves, prime movers and optimize them all for better efficiency and durability. An artificial lift solution is only as effective as the support it comes with, and Liberty Lift is unmatched in this regard. Liberty Lift has total control over its product lineup, from design and manufacturing, to installation and support. This level of control means we can guarantee the quality of the products we offer, and the services bundled with them once they are in operation. Liberty Lift’s pumping units exceed API quality and engineering standards in every respect, and our product lineup is comprehensive, from beam pumping units to advanced hydraulic jet pumping units and long stroke units. Liberty Lift’s mission is to generate the most cost effective artificial lift options for our clients, and a large part of that is our control over the process. The beam pump has been around for decades, and for good reason. It’s an extremely reliable and durable technology, with a simple design that is easy to set up and easy to operate. Even better, beam pumps can be moved from well to well with little effort, multiplying its economy. Liberty Lift’s beam pump units are even more efficient and reliable than the standard, and we offer a pair of designs for further customization. Our High Efficiency, or HE, units are Liberty Lift’s standard beam pump unit, with a double reduction, double helical involute design that exceeds API 11E standards. Our Enhanced Geometry, or EG, beam pump units are built with extended crank rotation, up to 192 degrees. The EG is therefore capable of extra pump fillage and fewer cycles, which will reduce wear and tear on downhole components. Both of Liberty Lift’s beam pump models are backed with industry-best installation and post-installation support, so as reliable as the beam pump is, Liberty Lift ensures they are even more so. Gas lift systems play a major role in modern oil and natural gas lift operations, as significant hydrocarbon plays, including those in the Permian Basin, demand a technology that can overcome wells affected by heavy solids. Liberty Lift’s gas lift systems offer this capability, and also provide a level of operational and mechanical simplicity that ensures excellent reliability over many years of operation. Liberty’s gas lift products are built with mandrels that meet API 19G1 standards, and valves that are flow performance-tested. The entire system is highly economical in its function, with few moving parts and the ability to handle deviated wells with few issues. Our gas lift systems are also built for continuous or intermittent operation, and downhole components can either be retrieved for service or serviced through wireline. Artificial gas lift systems are among the most forgiving forms of well stimulation on the market, and Liberty Lift’s version of the technology, with its simple function and control, makes it even easier to handle. Rod pump technology is among the oldest, and most proven, forms of oil & gas lift available. As such, it has been improved upon for decades, with seemingly little ceiling for additional upgrades. That is, until the introduction of longer stroke capabilities, an approach that Liberty Lift has optimized with its XL Long Stroke pump units. Liberty Lift’s XL Long Stroke offers an impressive 306 and 366 inch stroke length, slowing travel time and allowing for maximum volumetric efficiency. Longer stroke length means fewer cycles, as well, and this represents a major boost in durability. With fewer cycles, bottomhole valves are engaged with lower frequency, preserving their integrity for longer. Also, as the rod requires less speed to function, it can be accelerated gradually and linearly, so bottomhole valves and other components are exposed to lower compression forces. The primary benefit of the XL Long Stroke is productivity, but this can also be measured in extended component performance. The XL Long Stroke does both. The XL Long Stroke is a major step forward in well productivity, as well as economy. Liberty Lift is synonymous with quality artificial lift technology, as our solutions set the course for the industry. This is, in part, due to our ability to respond to our clients’ needs, no matter how challenging or extensive they are. We also partner with other industry-leading companies to help bring you the very best line of artificial lift products. Our hydraulic jet pump is the result of this kind of collaborative partnership. Hydraulic jet pump technology is a favorite option among well operators due to its unmatched versatility. Hydraulic jet pumps can lift just about any well, including extremely deep, crooked or remote wells. They are easy to maintain, can be used in offshore applications and can use fluids present in the well. In short, their design and capabilities are impressive. Our jet pumps are designed to handle a wide range of production, from 6,000 bpd down to 50 bpd. They can be retrieved without requiring wireline, a workover rig or a pulling unit. Downhole and proprietary software allows operators to monitor the formation and system performance. The surface pump utilizes excellent Wanner Engineering design and construction, is skid-mounted, and is built with a seal-less diaphragm positive displacement pump for reduced downtime and maintenance. The pump is optimized for frac operations as well, as it can handle large volumes of return fluids without taking an efficiency hit. The Liberty Lift and JJ Tech hydraulic jet lift system is available for purchase or rent, and is ready for any well.